The main element in any business is building a good relationship. 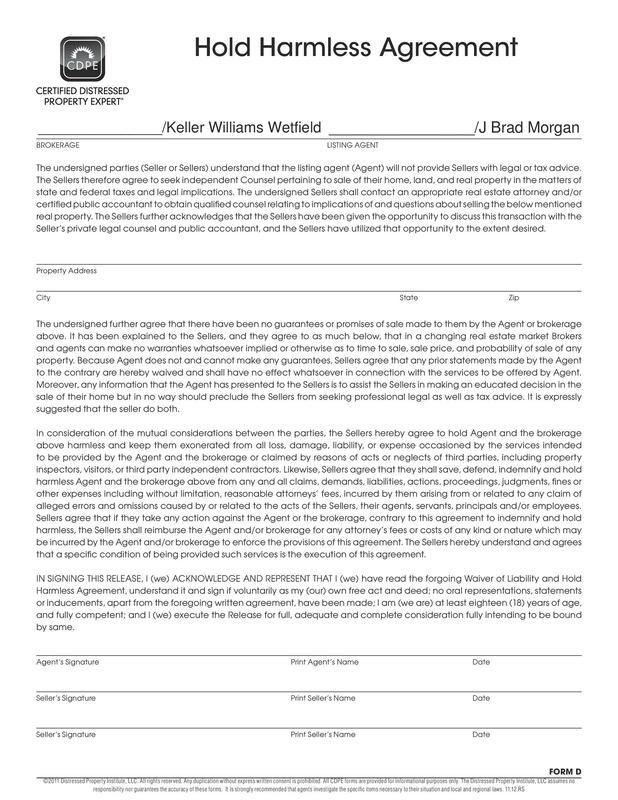 So, do you sign hold harmless agreement with your clients to ensure a long lasting relationship? If not, then you are not doing it right. Keeping you and your client close, a hold harmless agreement also ensures to secure you and limit legal liability. Putting all the terms and conditions in writing before providing a service or taking part in a transaction, a hold harmless form protects you from unforeseen legal claims. 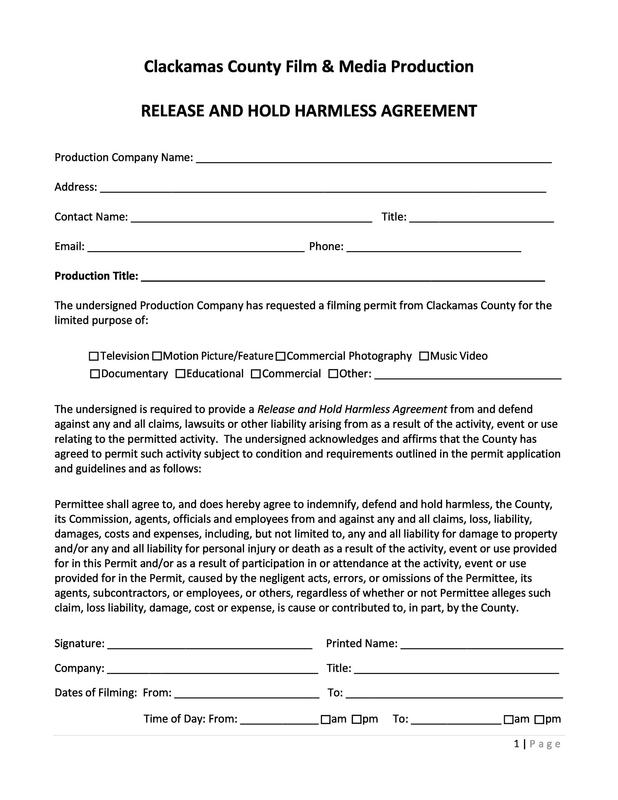 1 What is a Hold Harmless Agreement? 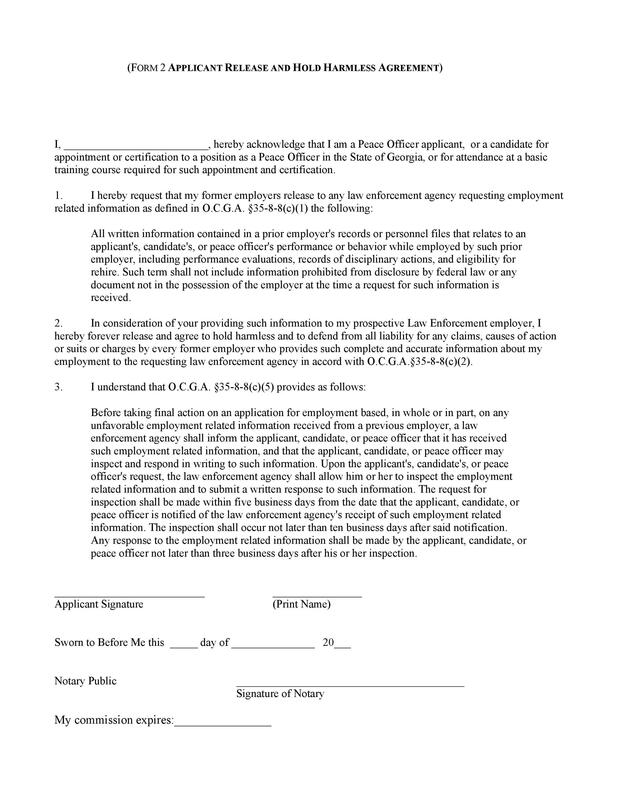 3 When to Use a Hold Harmless Agreement Template? 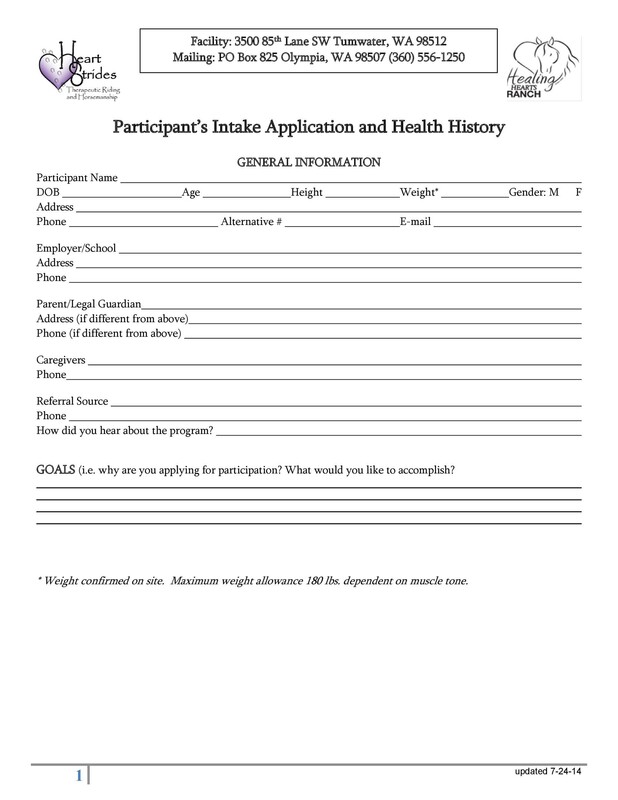 5 When Not to Use a Hold Harmless Agreement Template? 6 Is the Hold Harmless Agreement Always in Your Interest? 8 What are the Types of a Hold Harmless Agreements? 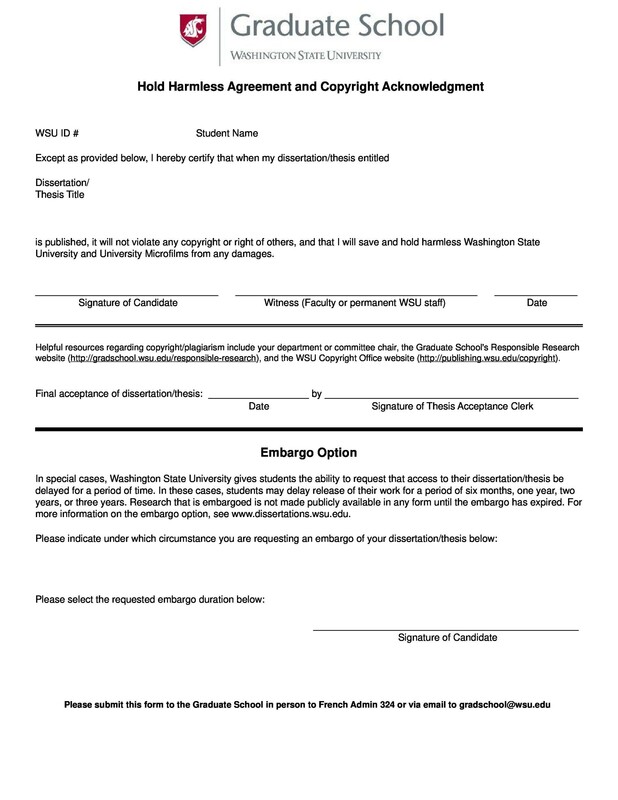 9 What Does the Hold Harmless Agreement Template Include? 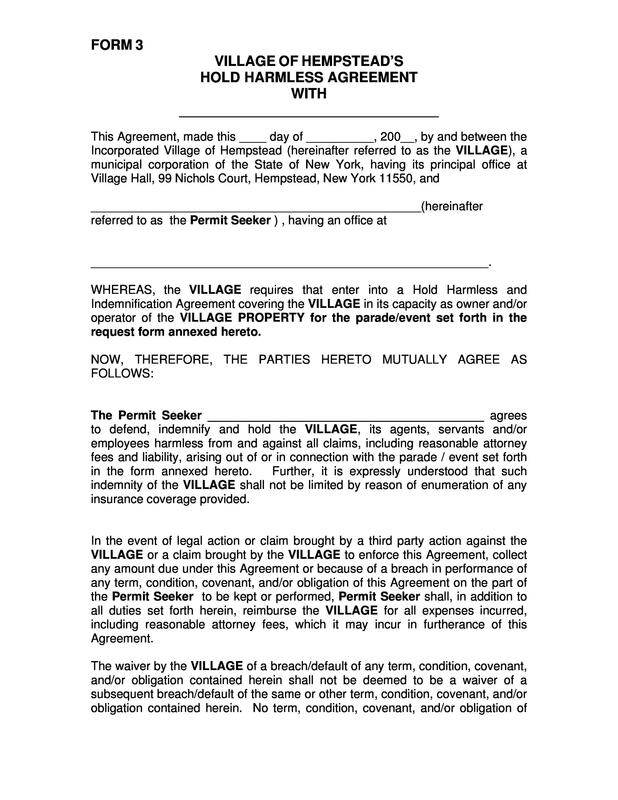 11 How to Write or Create a Hold Harmless Agreement Template? 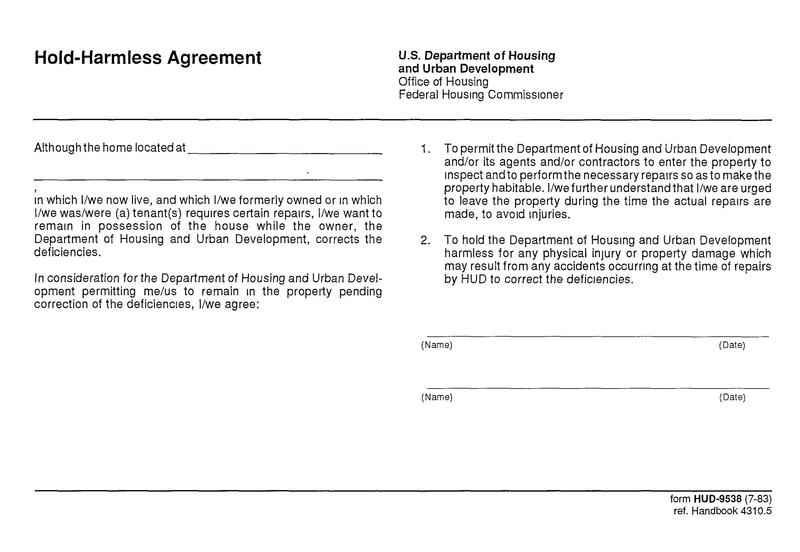 12 For How Long is the Hold Harmless Agreement Valid? You must also form a hold harmless agreement with the ones you trust. In this litigious society, you never know how situations and people can change. Therefore, it is essential to use a hold harmless agreement in advance to limit liabilities for yourself or else, you may end up getting bankrupt because of paying off the liabilities. If you really wish to protect and neglect your business from the lawsuits coming from someone else’s business, then forming a hold harmless agreement is a better option for you because it helps you avoid liabilities before they even occur. In this article, you will get to know everything you need to know about a hold harmless agreement sample. 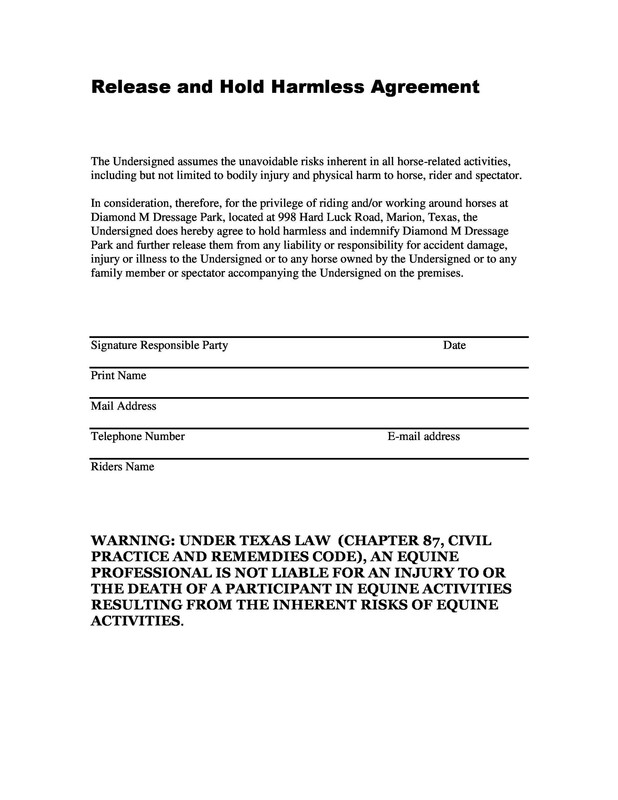 If you want to understand what a hold harmless agreement is, then you should understand that a hold harmless agreement is a clause which determines that an organization or an individual is not liable for damages or injuries caused to the party or individual signing the contract. 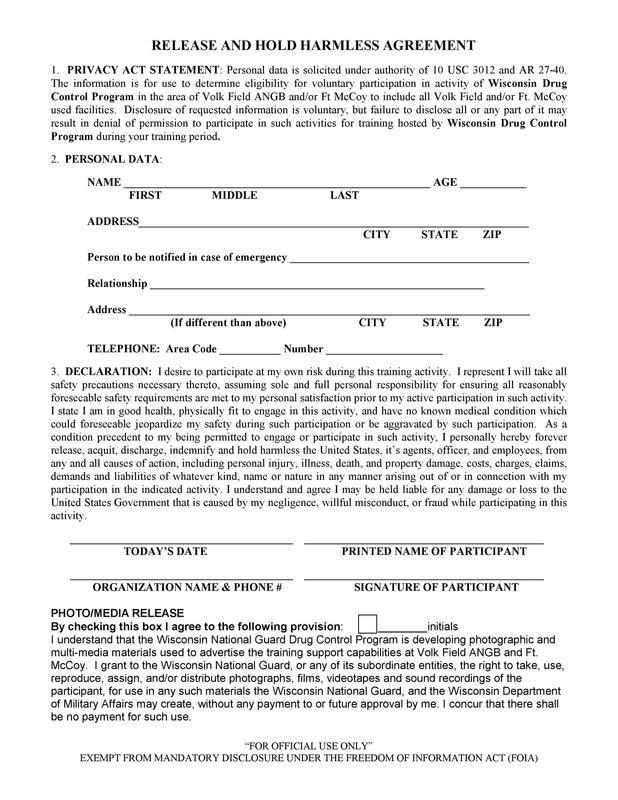 An entity may also ask an individual to sign a hold harmless agreement form when they are carrying out any activity which is associated with risk. The reason being; an entity wishes to secure themselves and does not want to be blamed. 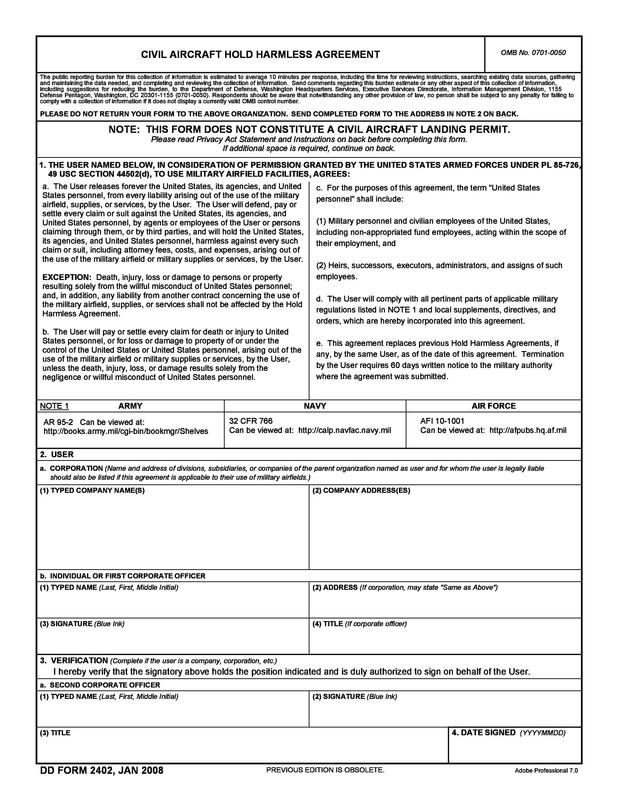 A hold harmless agreement has many names such as hold harmless provision, hold harmless agreement form, hold harmless agreement sample, hold harmless agreement template, hold harmless letter, indemnity agreement, waiver of liability, hold harmless release and release of liability. 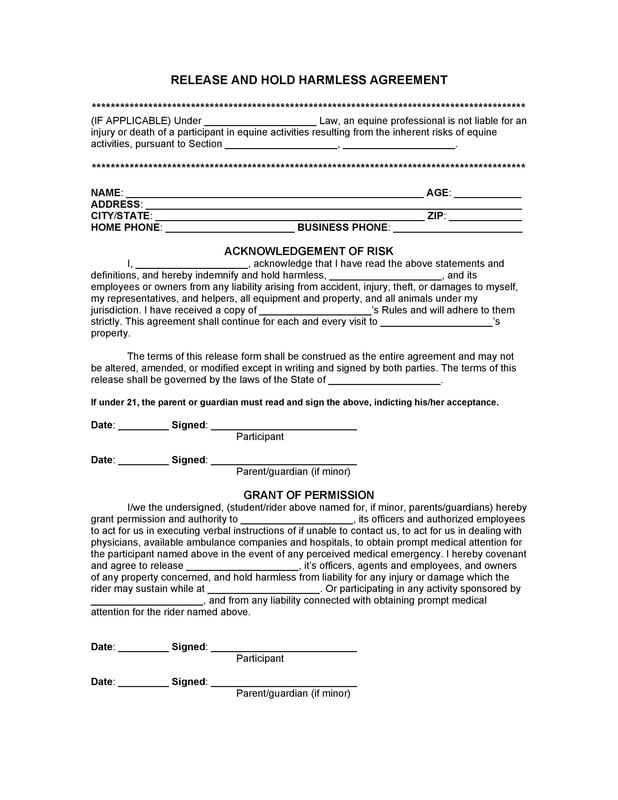 Most commonly, a hold harmless agreement form is used in construction and real estate. In addition to this, things that involve high risk activities such as sports clubs and skydiving may also result in such clauses. Moreover, a hold harmless agreement can either be a reciprocal or a unilateral. A reciprocal hold harmless agreement sample means that both the parties agree for the limited liabilities and losses. On the contrary, a unilateral hold harmless agreement form determines that only a single party has agreed upon the contract, holding the other party liable for the damages and injuries that may occur. Let’s take an example of a sports club for better understanding what a unilateral agreement is. A sports club representative involves a hold harmless agreement in their contract determining that a member cannot sue them if they are injured while playing a tennis match. The members are only allowed to play at their own risk. In this type of agreement, the representative of the sports club asks the participant to accept all types of risks including the risk of the smallest of injuries and even death. Additionally, there are certain contractors who need a hold harmless contract to secure themselves from potential liabilities occurring at work; meaning that they form a reciprocal agreement. Let’s assume a contractor adds a deck to a private residence forming a hold harmless agreement in anticipation of losses that might occur in future. 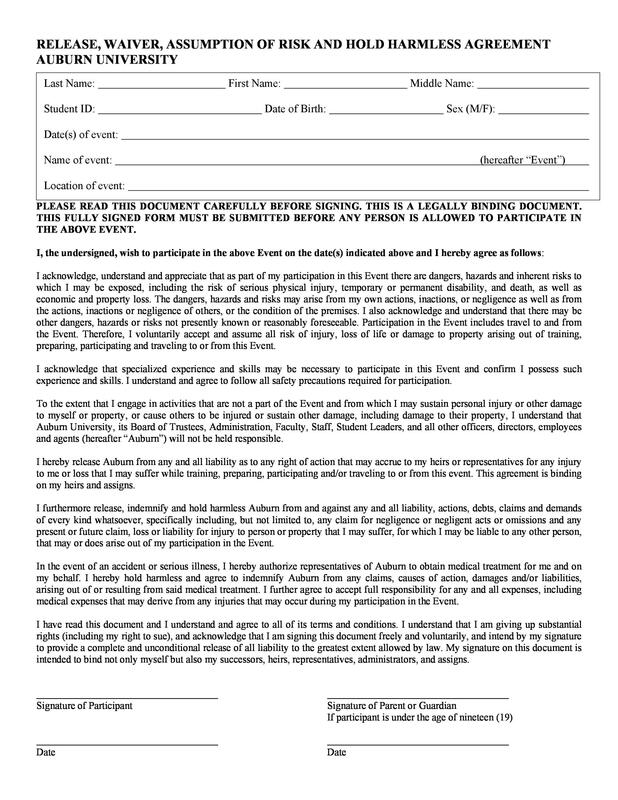 Similarly, the homeowner will also prepare a hold harmless agreement sample to prevent a lawsuit if the contractor suffers from an accident while doing the homeowner’s work. 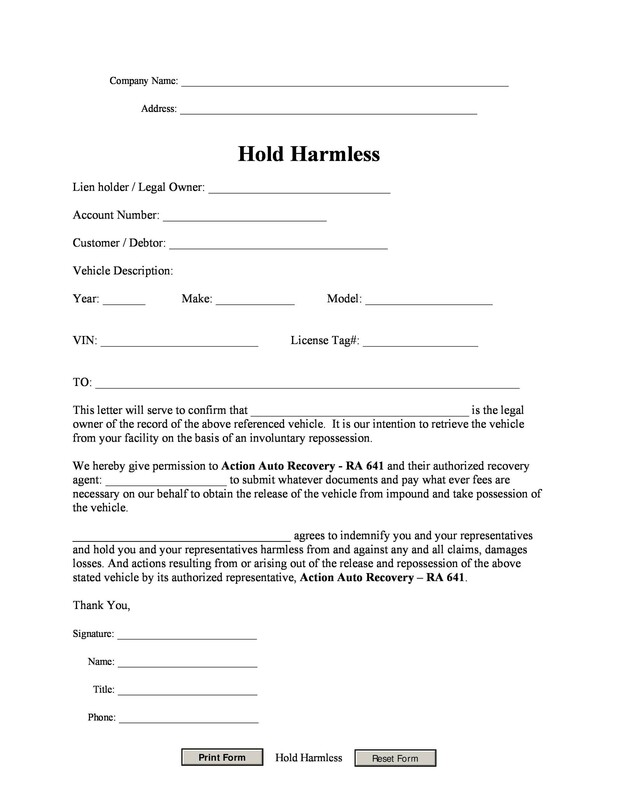 When to Use a Hold Harmless Agreement Template? Established between two parties and protecting them from any unforeseen liabilities, claims, lawsuits and losses, a hold harmless agreement form ensures that you do not have to pay off the debts. 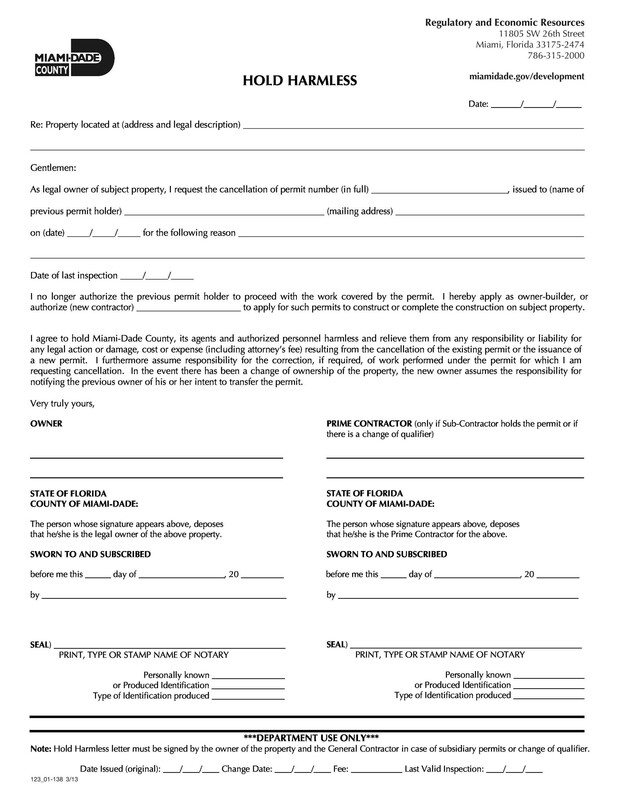 Though there are many circumstances where a hold harmless agreement template or form can come in handy, here are some typical situations which may require you to look for a hold harmless agreement template. 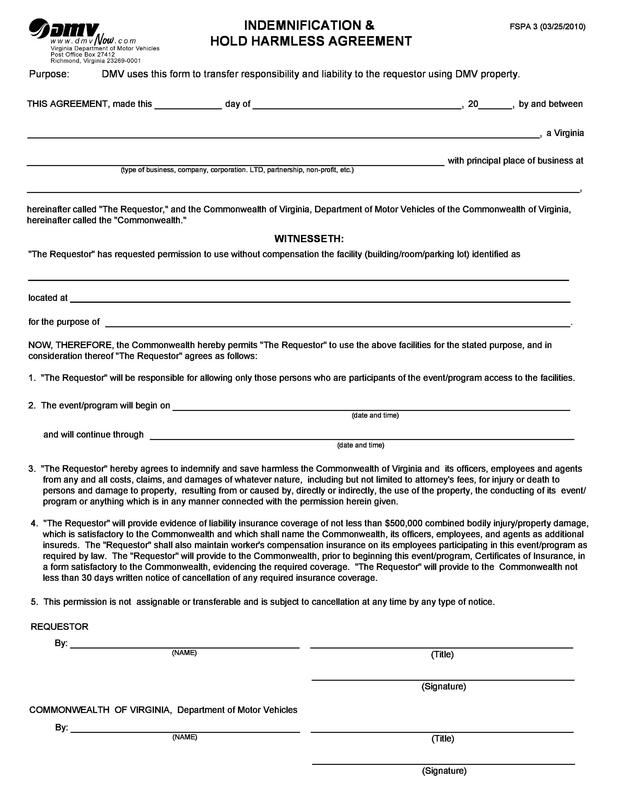 If your business hires a contractor or an employee, they are permitted to use a hold harmless agreement form to clear off the responsibility of injuries, accidents or any losses that occur by contractors or employees in the workplace. Also, you may require a hold harmless agreement sample before a tenancy. 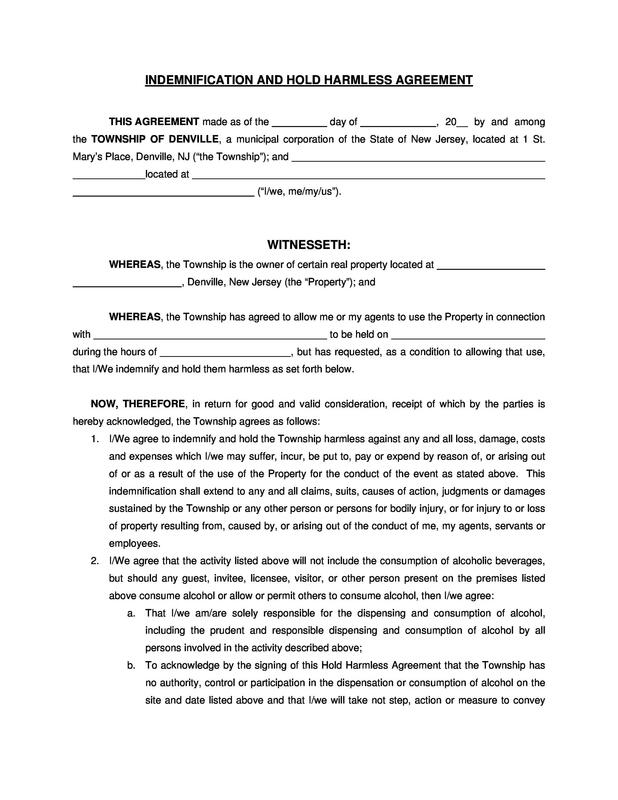 A landlord may include this agreement stating that they will not be liable for the tenant’s negligence over the rental property. If an individual is a representative of a charitable organization, concert or anything similar, they may need a hold harmless agreement to protect themselves from the potential losses or accident. 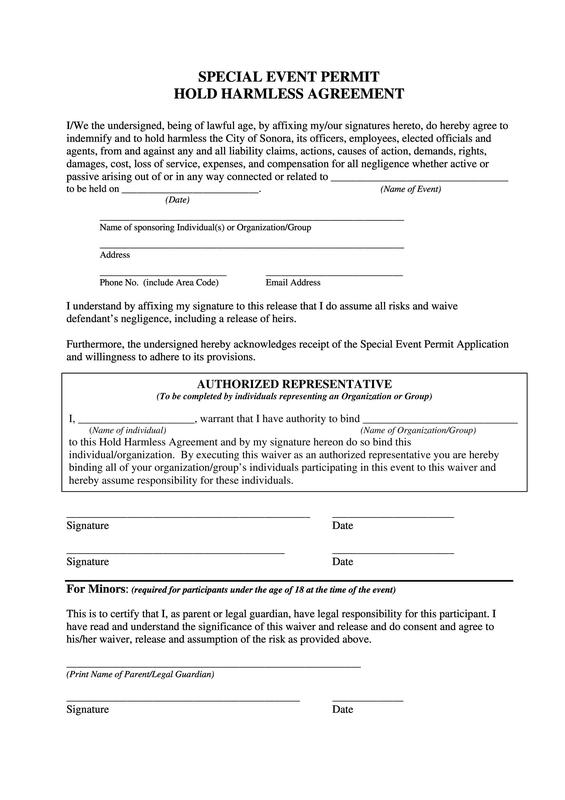 Business owners having high risk businesses such as skiing or sky diving companies and amusement parks may also require their customers to sign a hold harmless agreement form in order to not avoid being charged for any damages or injuries which may occur to their visitors. Consultants may have their clients sign a hold harmless agreement form to release them from liabilities that result from the workplace. 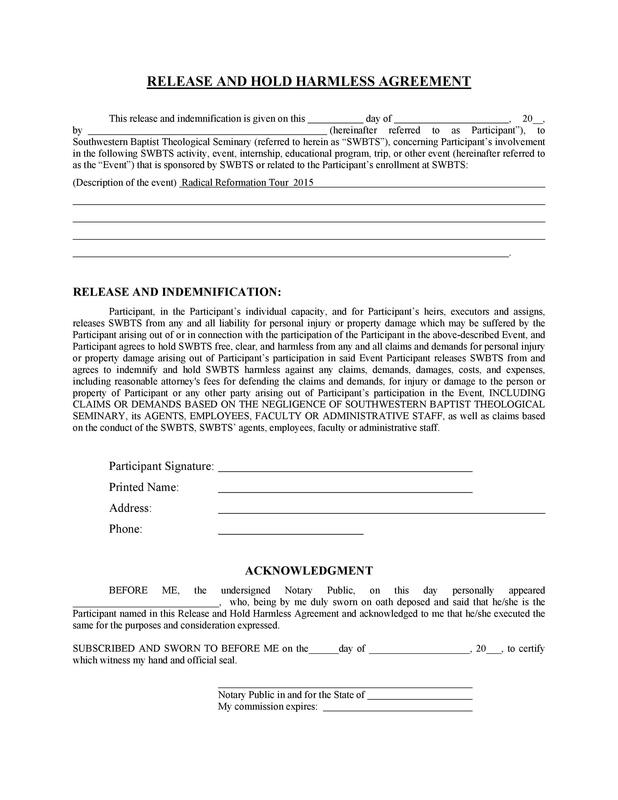 When Not to Use a Hold Harmless Agreement Template? A hold harmless agreement template or sample is not enforceable if the indemnitee was found to be negligent about the faulty equipments, poor maintenance and improper attention. Is the Hold Harmless Agreement Always in Your Interest? 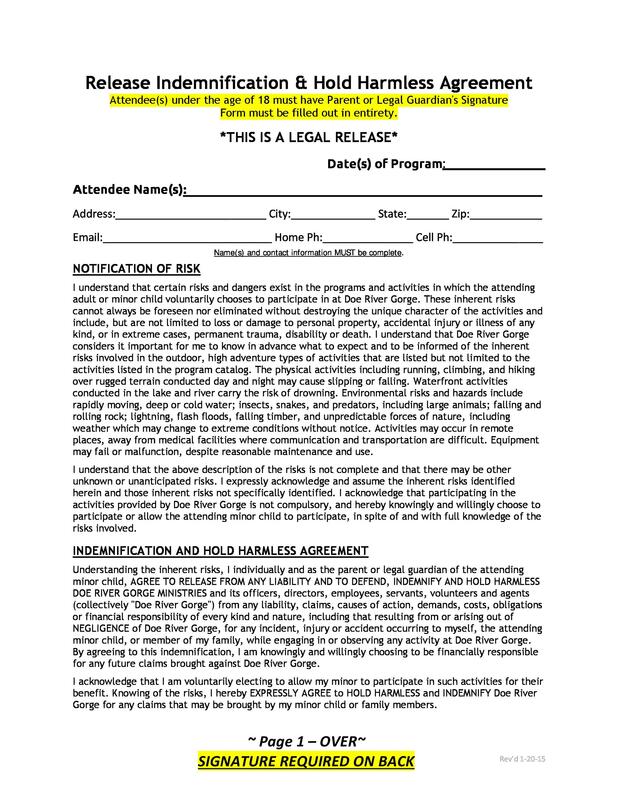 The hold harmless agreement template actually releases a party from potential losses and claims. Therefore, this cannot always be of interest to you. You should never assume liability, especially for someone you do not trust or may not know. 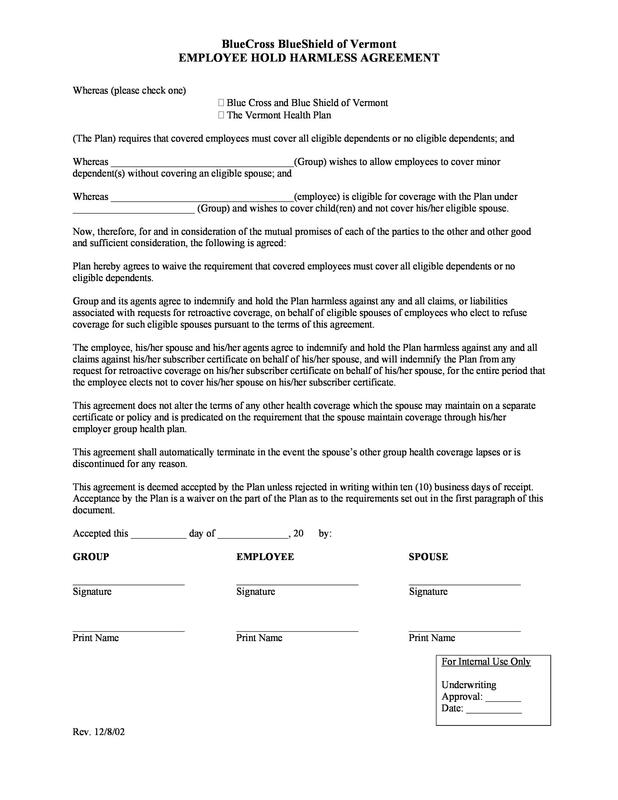 Some of the hold harmless agreements are really written to ensure protection for the business and complying with the terms of contract perfectly. It may always not be in the best interest for you as it may ask you to provide insurance coverage for the risk and losses suffered or associated with the contract to secure you from any unforeseen liability. What if the losses exceed your insurance limits? What will you do then? Therefore, you must first understand that a hold harmless agreement is not always better for you to sign. So, ensure to read it carefully because a hold harmless agreement is not always beneficial. 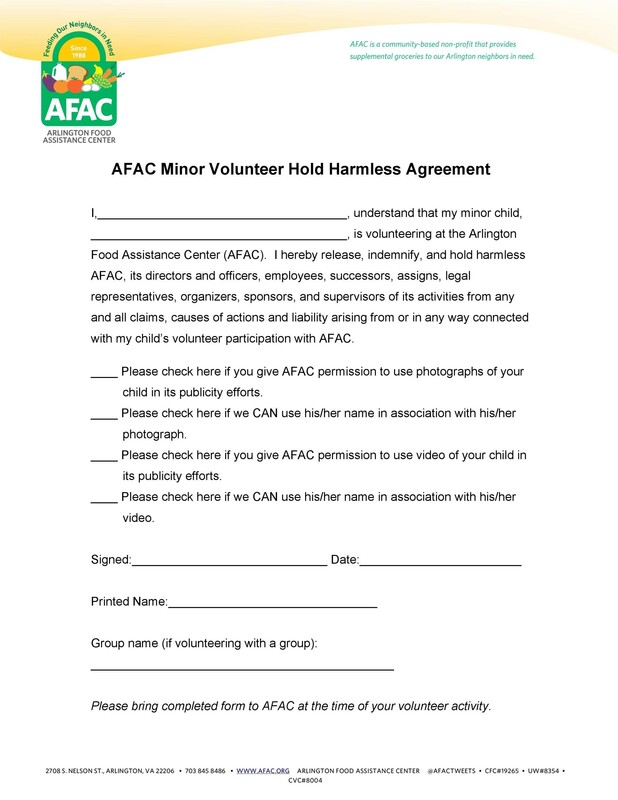 What are the Types of a Hold Harmless Agreements? 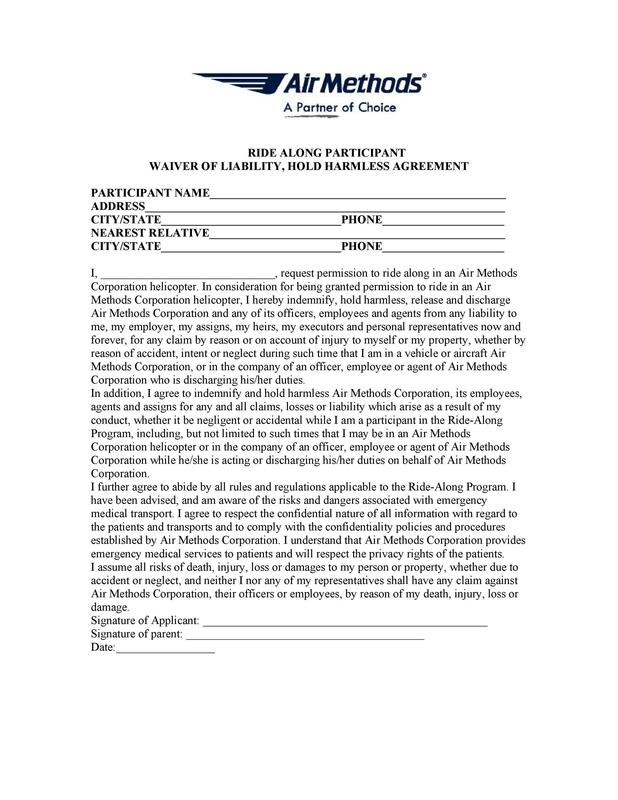 In this form of hold harmless agreement, the subcontractor who is being insured assumes liability for accidents, negligence and combined negligence for both parties. 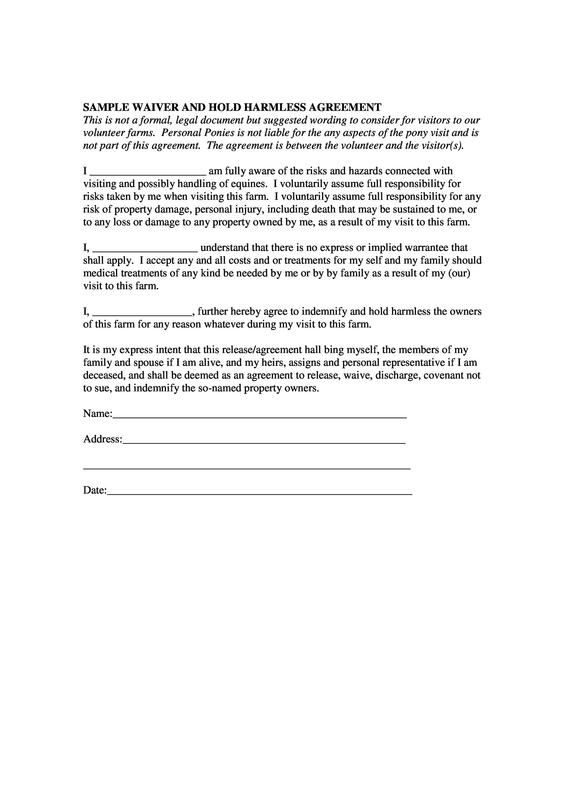 This is the type of hold harmless agreement template which is not commonly used because of its broad terms and conditions. 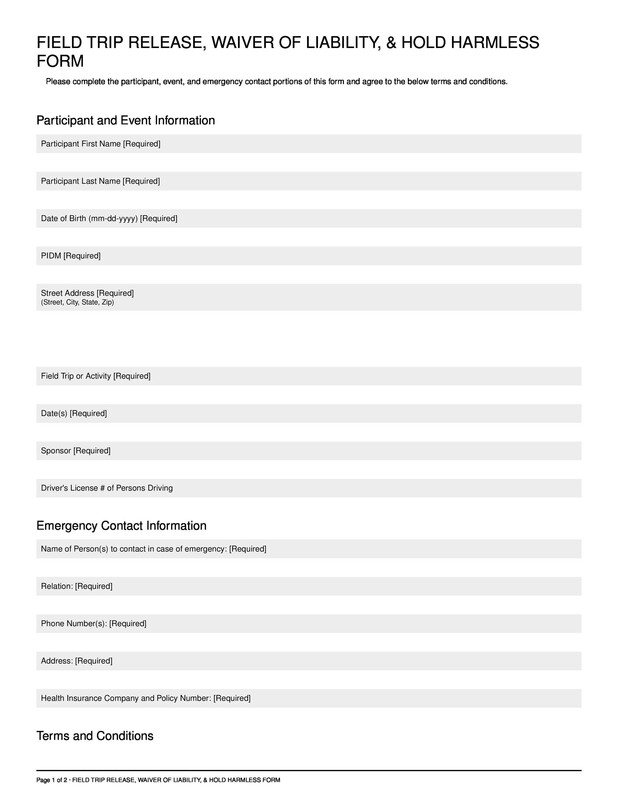 To finance this form, the subcontractor finances its own liability with extra insurance policy. 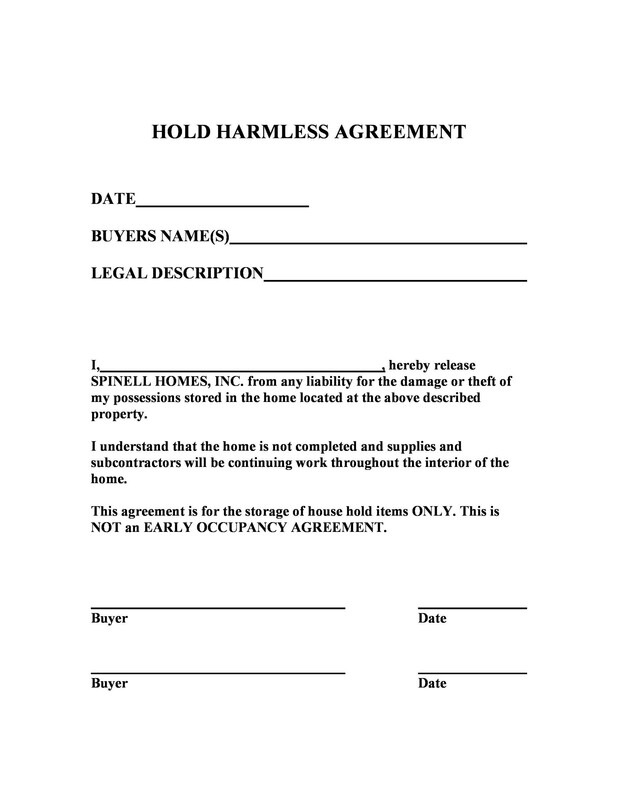 The second most common type of hold harmless agreement is the intermediate type. Under this agreement, it is the subcontractor who assumes all losses and liabilities for the negligence and accidents. In this, it is the subcontractor who is responsible for the related actions not held accountable for the general contractor’s negligence and accidents. The reason for using this type is mostly because it is not dependent upon the subcontractor’s fault. It just depends on who acted in a negligent manner or who was the major party behind the accident. In this case, both the parties, the contractor and subcontractor are negligent. In this type of hold harmless agreement, the subcontractor is held responsible and accountable for the accident and negligence but it is only on a limited form. Here, the subcontractor will only assume liability for the part which was their responsibility. 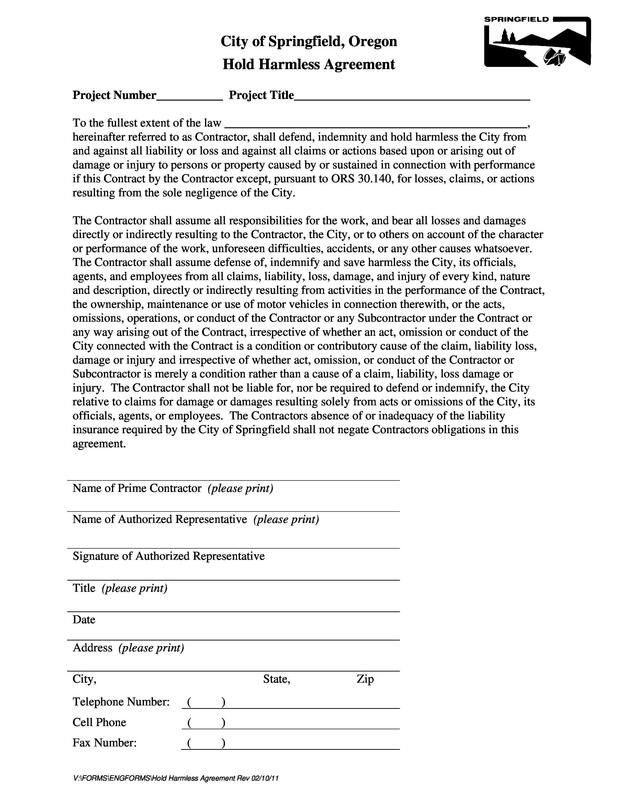 This type of hold harmless agreement basically limits the liability of the subcontractor to only their responsibility and includes other’s responsibilities on the basis of their corresponding parts. 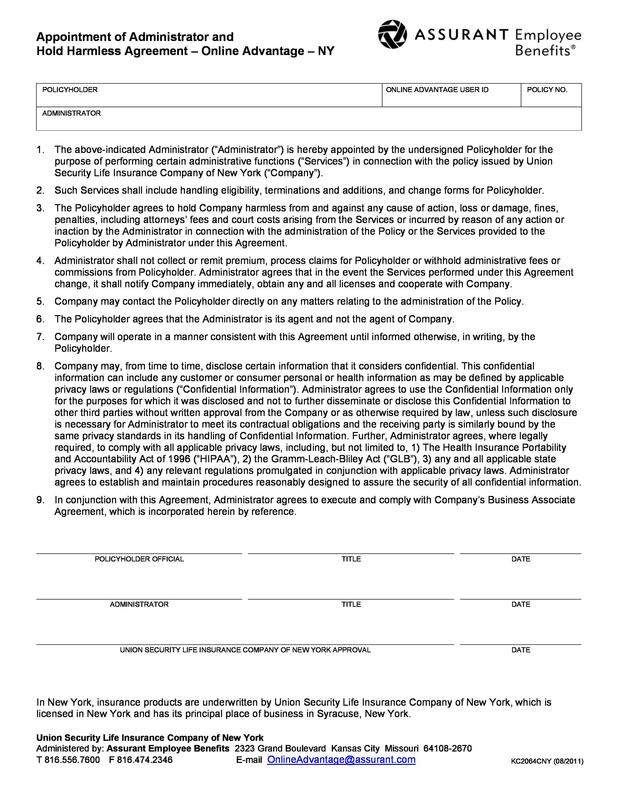 What Does the Hold Harmless Agreement Template Include? 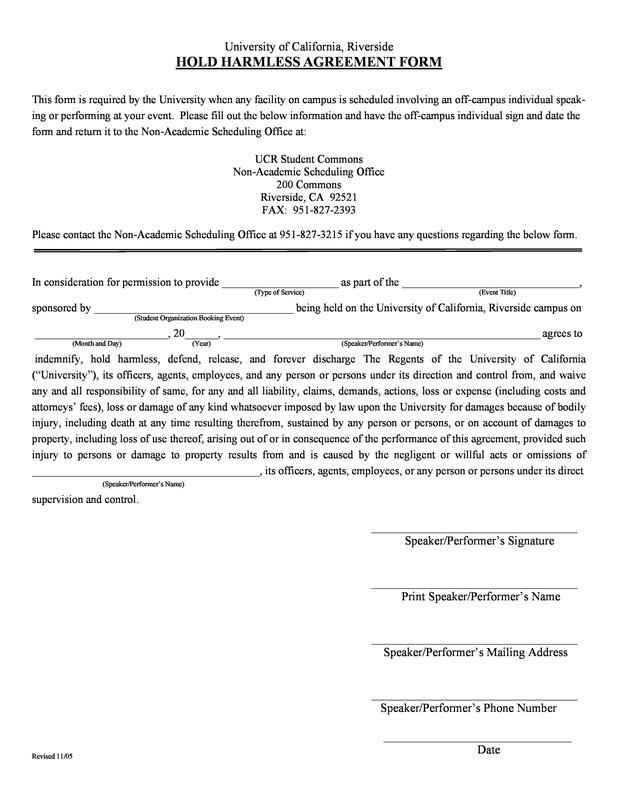 How to Write or Create a Hold Harmless Agreement Template? 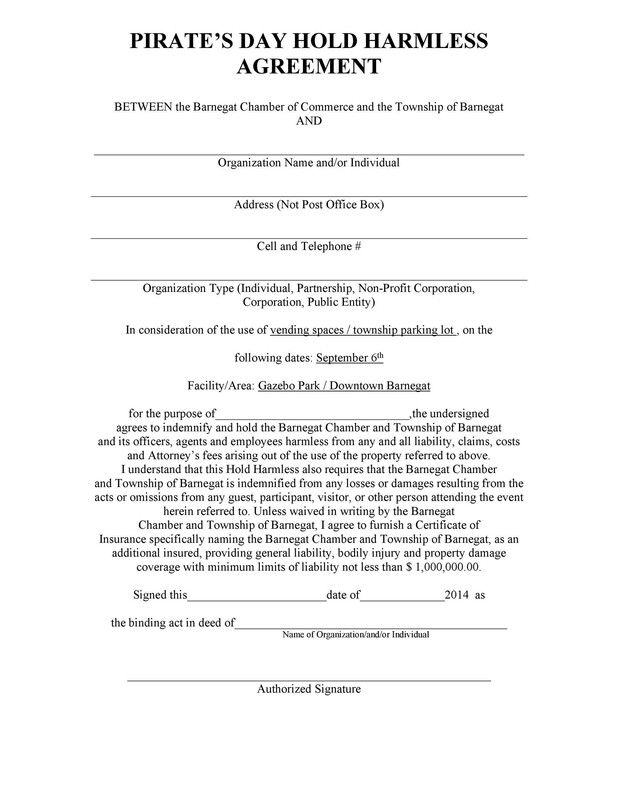 When you hold harmless or grant indemnity to a business entity or an individual, this means that a party in a contract accepts the responsibilities for all types of damages, injuries and liability claims. These agreements can also be a standalone declaration but they are incorporated as provisions and clauses in other legal contracts. 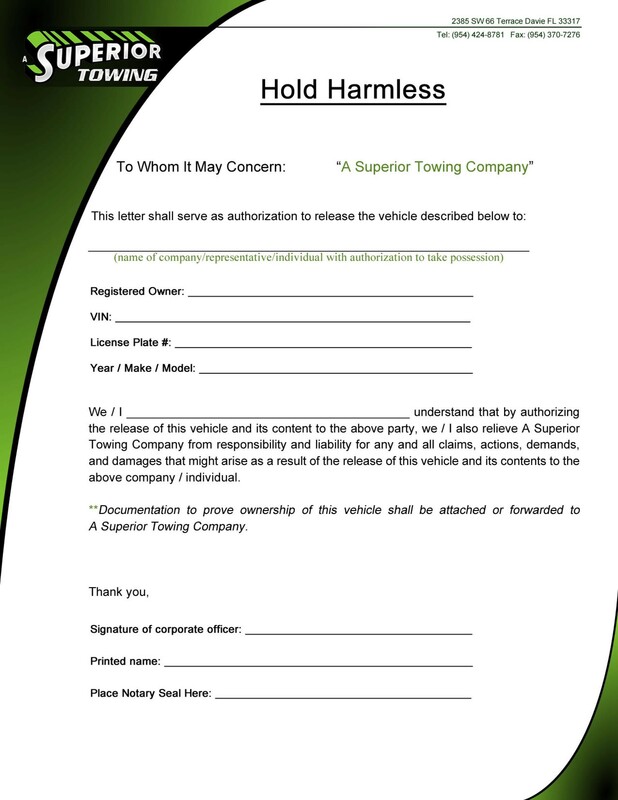 The first part to writing a hold harmless agreement is to write a preamble or introduction. The parties in an indemnity agreement are known as the indemnitor and the indemnitee or promisor and promisee. In the introduction, you need to mention both the parties along with their legal names, street addresses and date of execution. All these items would become the headline of the contract. Since you are writing an introduction, it will be followed by a background highlighting what the promisor wants for the regulatory complaints, damages, injuries, personal liabilities, civil lawsuits or any other type of loss that may occur due to a certain activity. This is the section where the promisor commits to take full charge and responsibility for the number of liabilities. However, it is important for the promisor to know that the promise can only extend to the civil realm. This actually means that violating the law may lead to criminal charges for any of the parties. Also, losses from gross negligence and hateful intentions of the promisee are excluded from this section. Just like criminal acts, hateful intentions and gross negligence is easily excluded from the hold harmless agreement template, the same way the parties can also agree to exclude certain damages and losses such as legal obligations and previous debts. Next in the list is stating the notice of claim. You must always clearly state the claim notification and valid process of losses. 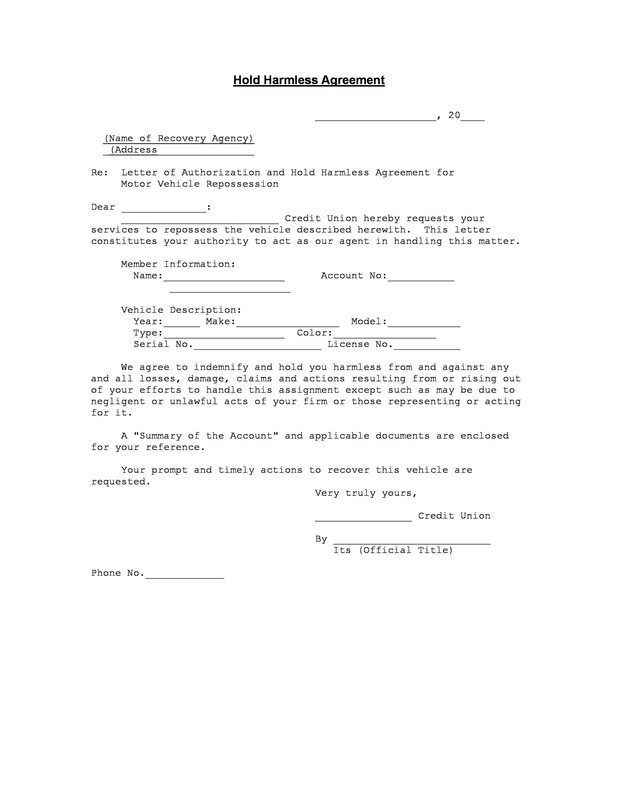 Notice of claim may include the address, time frame to deliver the notice and the information required for the reason of making the notice suitable. 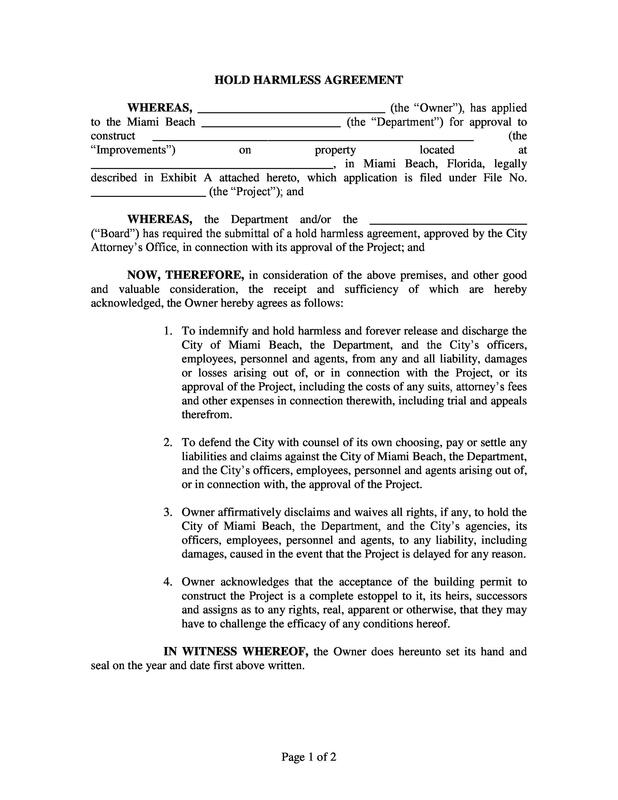 In the last step, when the promisee agrees to follow the procedures and enables the hold harmless agreement, both the parties need to sign the hold harmless agreement to serve as proof that the promisee and promisor have read and agreed to the listed terms and condition in the contract. 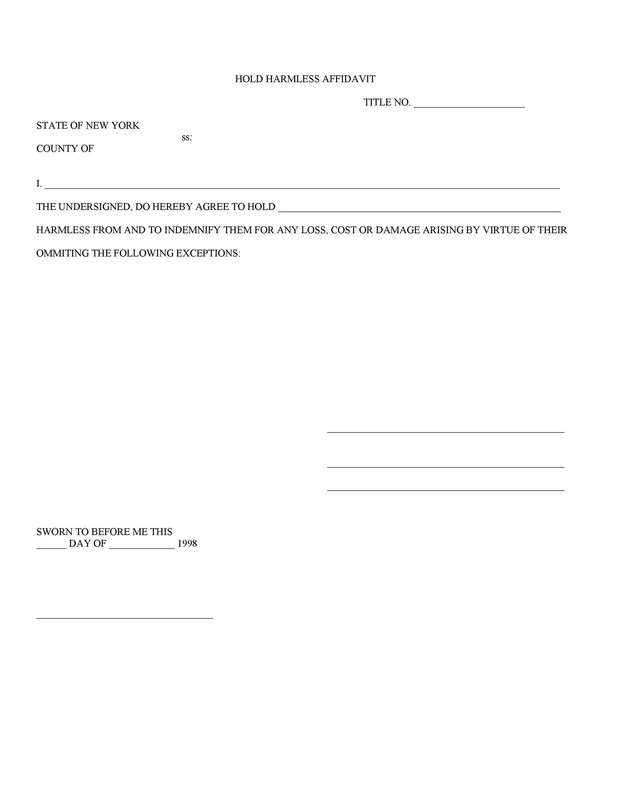 In certain situations, you need to sign the hold harmless agreement in front of the notary public too. 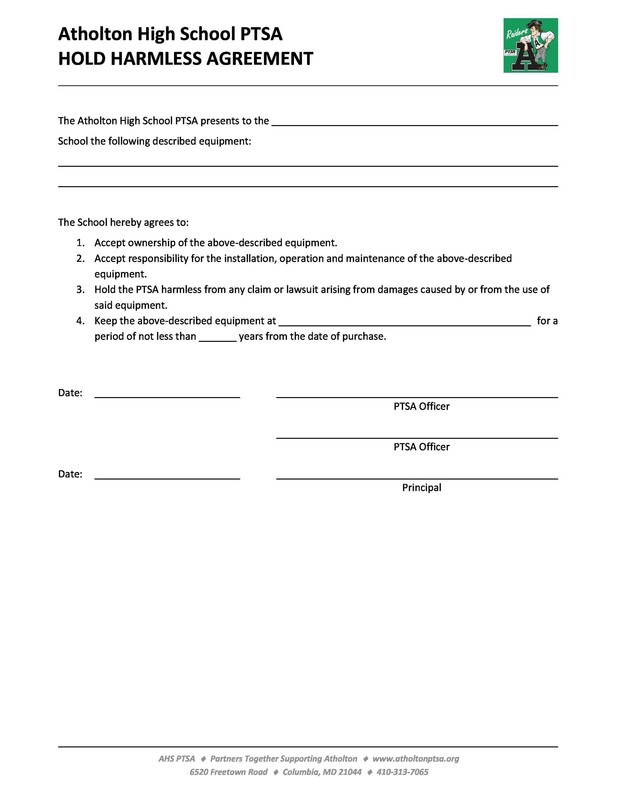 On signing the agreement, you need to ensure about keeping copies for yourself and the other party while keeping the original one in a safe place. 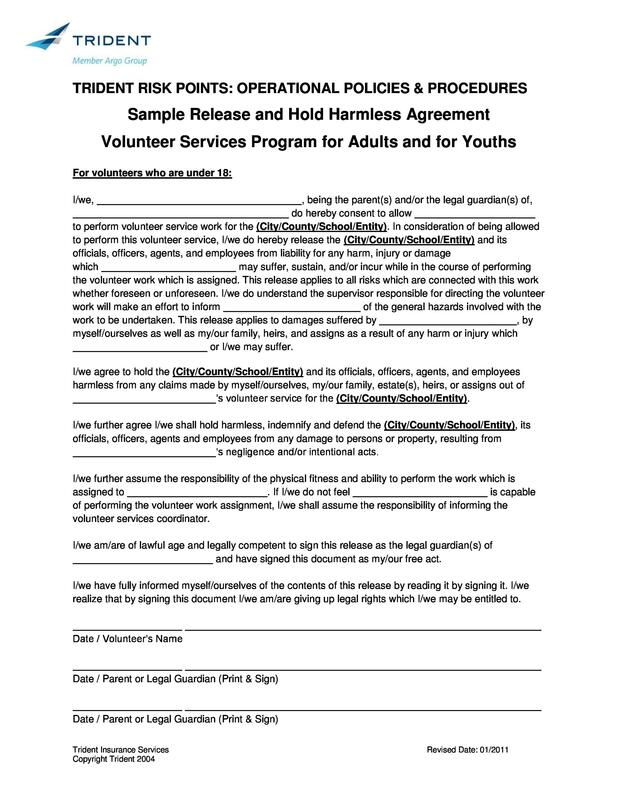 For How Long is the Hold Harmless Agreement Valid? The validity of the hold harmless agreement depends from state to state. Some states have anti-indemnity laws that will prohibit these agreements while some states are broad in terms of the language. If you wish to know about the validity of your state, you must consult your local attorney about the enforceability of a hold harmless agreement in your state. 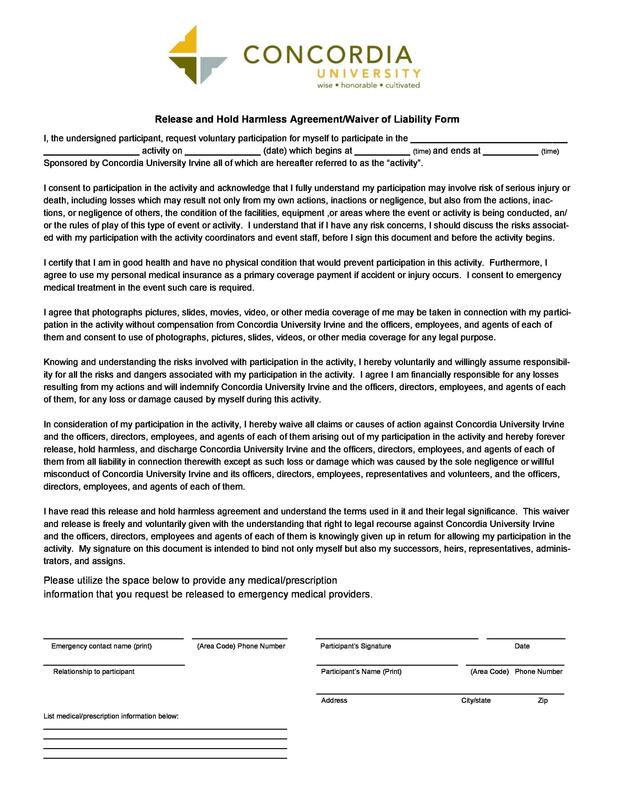 If you really want to strengthen the business relationship with your clients, you must form a hold harmless agreement form and secure yourself, enjoying a long lasting relationship in the process. 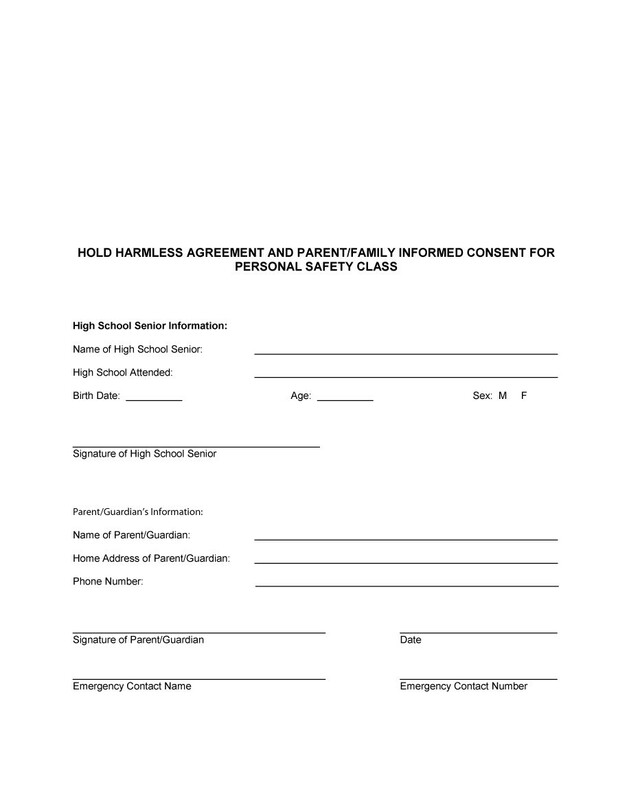 To avoid mistakes and errors and creating a hold harmless agreement sample on your own, you must download a hold harmless agreement template from our website today. Simply edit it and save time and effort as a result!